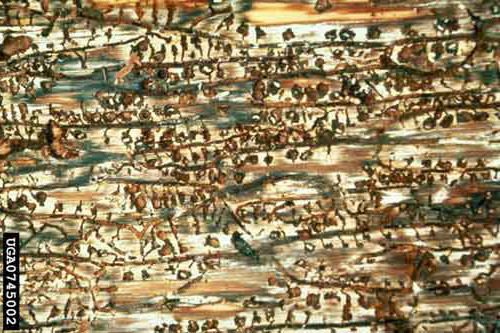 Like other pine bark beetles, Ips pine engravers live predominantly in the inner bark, where they breed and feed on phloem tissue. 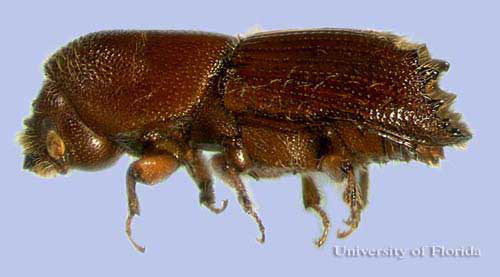 Pines successfully colonized by Ips engravers, if not already dead, are killed by adult and larval feeding in the phloem (which can girdle the tree) and by colonization of the sapwood with blue-stain fungi that the beetles introduce. The blue-stain fungi spread into the xylem and block water flow, serving to hasten tree mortality (Connor and Wilkinson 1983, Kopper et al. 2004). Ips beetles usually colonize only those trees that are already stressed, declining, or fallen due to other environmental or biotic factors. 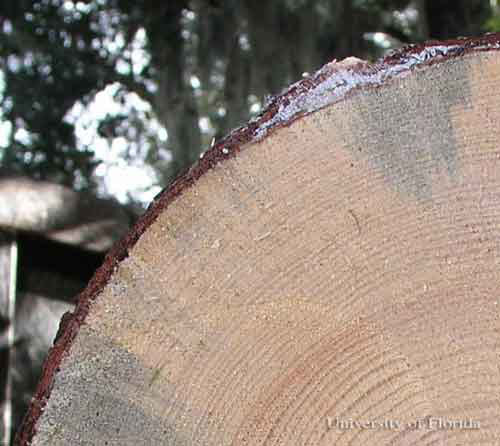 Ips also readily colonize cut logs and slash, and are attracted to fresh pine odors. Infestations may occur in response to drought, root injury or disease, timber management activities, lightning strikes, or other stresses, and sometimes occur in association with attacks by Dendroctonus frontalis or Dendroctonus terebrans (Anderson and Anderson 1968, Lovelady et al. 1991, Miller 1983). 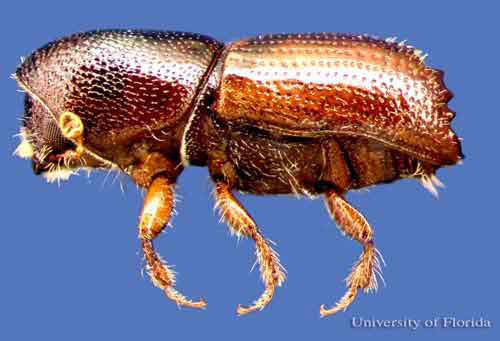 When populations of Ips beetles are sufficiently high, they can overcome the defenses of apparently healthy trees by attacking in large numbers. However, Ips outbreaks are greatly limited in duration and spatial scale compared to outbreaks of the more aggressive Dendroctonus frontalis (Anderson 1977). All three Ips species can be found throughout Florida in areas where pines occur. Ips calligraphus has two recognized subspecies, Ips calligraphus, found throughout much of the eastern US, north to southern Ontario, Canada, and Ips ponderosae, a western US subspecies. Figure 1. Adult sixspined ips, Ips calligraphus (Germar). Photograph by David T. Almquist, University of Florida. Figure 2. 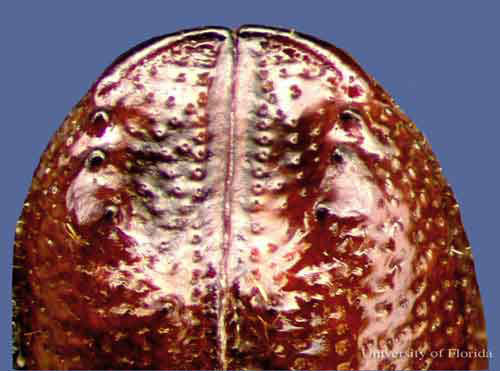 Dorsal view of the elytral apices of an adult sixspined ips, Ips calligraphus (Germar). Photograph by David T. Almquist, University of Florida. Figure 3. Adult eastern fivespined ips, Ips grandicollis (Eichhoff). Photograph by David T. Almquist, University of Florida. Figure 4. 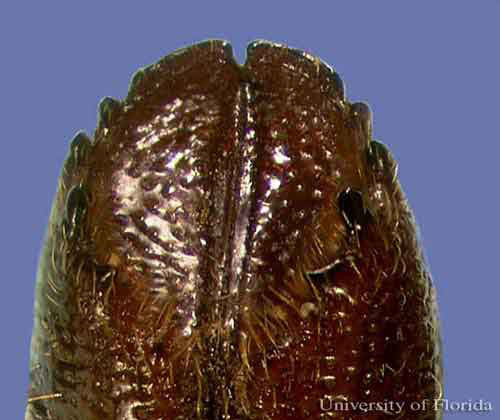 Dorsal view of the elytral apices of an adult eastern fivespined ips, Ips grandicollis (Eichhoff). Photograph by David T. Almquist, University of Florida. Figure 5. Adult small southern pine engraver, Ips avulsus (Eichhoff). Photograph by David T. Almquist, University of Florida. Figure 6. 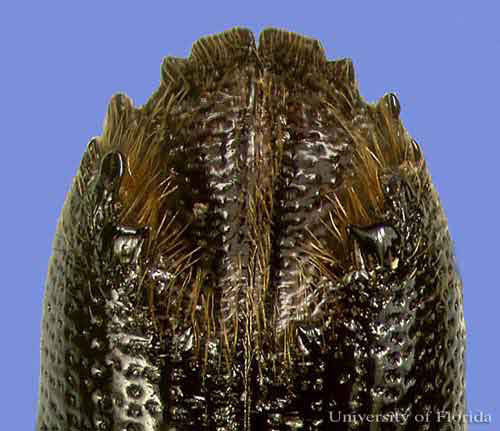 Dorsal view of the elytral apices of an adult small southern pine engraver, Ips avulsus (Eichhoff). Photograph by David T. Almquist, University of Florida. Eggs: Eggs are oblong (ca. 1.0 mm × 0.5 mm) and pearly white. Larvae: Larvae are small, whitish, legless, and grublike with reddish colored heads that are <1 mm wide. Figure 7. Inner bark gallery characteristic of the sixspined ips, Ips calligraphus (Germar). Photograph by Ronald F. Billings, Texas Forest Service; http://www.forestryimages.org. Figure 8. Inner bark gallery characteristic of the eastern fivespined ips, Ips grandicollis (Eichhoff). Photograph by Jeffrey M. Eickwort, FDACS. Figure 9. Inner bark gallery characteristic of Ips avulsus (Eichhoff). Photograph by Ronald F. Billings, Texas Forest Service; http://www.forestryimages.org. Figure 10. Fading crown, a possible sign of an Ips engraver beetle infestation. Photograph by John L. Foltz, University of Florida. Figure 11. Blue-stain fungi in the sapwood, emanating from an Ips gallery in the phloem, a possible sign of an Ips engraver beetle infestation. Photograph by John L. Foltz, University of Florida. Figure 12. Boring dust, a possible sign of an Ips engraver beetle infestation. Photograph by Albert E. Mayfield III, FDACS. Figure 13. Pitch tube, a possible sign of an Ips engraver beetle infestation. Photograph by Wayne N. Dixon, FDACS. 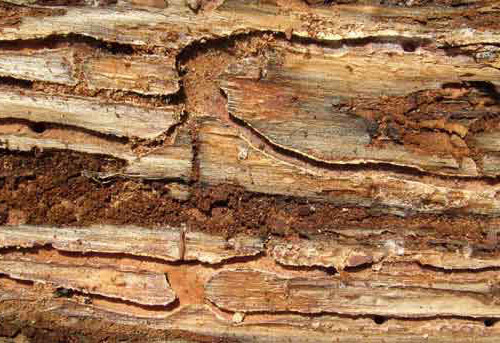 Unlike those of the southern pine beetle, Ips pitch tubes are more commonly seen on the surface of bark plates than in bark crevices. 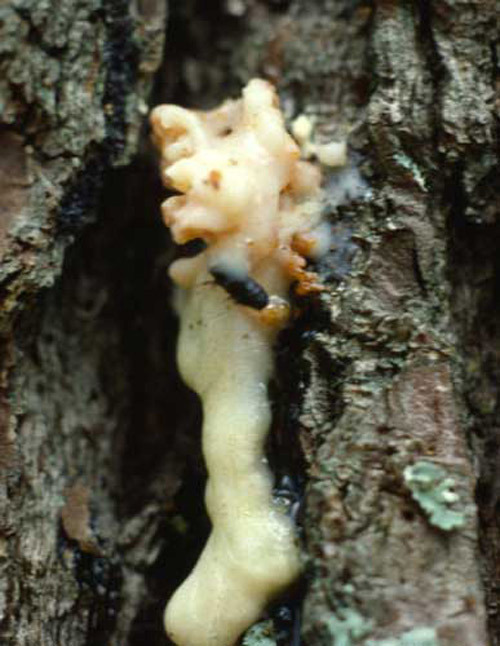 After beetles emerge from the tree, scattered circular emergence holes (1 to 3 mm diameter) can be observed on the outer bark. By removing a section of the outer bark, the characteristic Y-, I- or H-shaped galleries may be observed in the phloem or engraved on the outer sapwood (Connor and Wilkinson 1983). 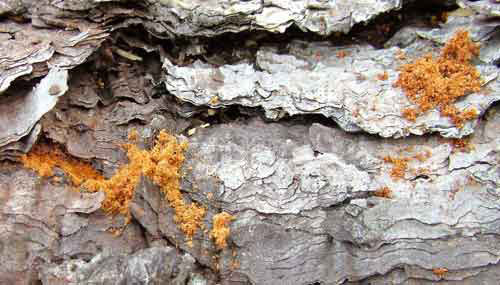 In some cases, the application of an approved insecticide that coats the entire tree bole may be warranted to protect high-value landscape trees from infestation; contact your local county Cooperative Extension Service office for current insecticide recommendations. 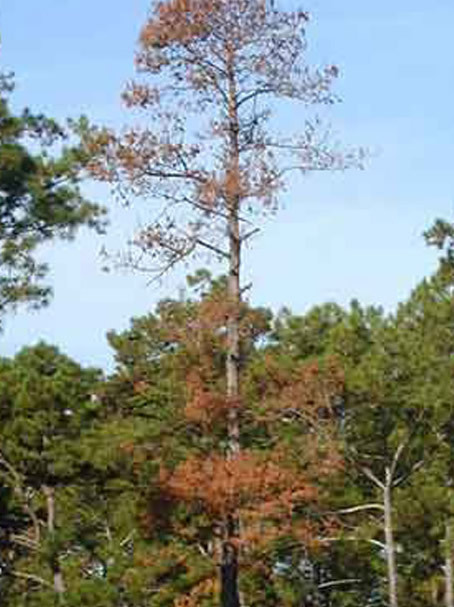 When infested trees are removed, care should be taken to avoid injury to surrounding pines. There is no effective way to save an individual tree once it has been successfully colonized by Ips beetles (Connor and Wilkinson 1983, Dixon 1984, Thatcher et al. 1978). Anderson NH, Anderson DB. 1968. 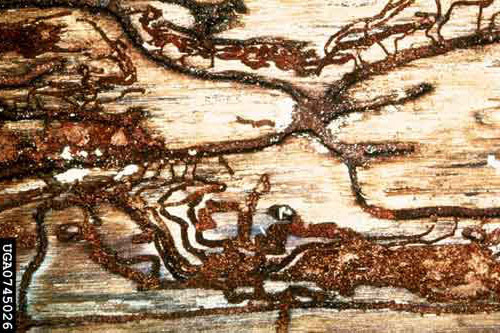 Ips bark beetle attacks and brood development on a lightning-struck pine in relationship to its physical decline. Florida Entomologist 51: 23-30. Anderson RF. 1948. Host selection by the pine engraver. Journal of Economic Entomology 41: 596-602. Anderson RF. 1977. Dispersal and attack behavior of the southern pine engraver Ips grandicollis Eichh., Coleoptera, Scolytidae. Pg. 17-23 In Technical Bulletin 310. Technical Bulletin of the Agricultural Experiment Station, University of Minnesota. Coulson RN, Witter JA. 1984. Forest Entomology: Ecology and Management. John Wiley & Sons, Inc. 315-318. Kopper BJ, Klepzig KD, Raffa KF. 2004. Components of antagonism and mutualism in Ips pini-fungal interactions: relationship to a life history of colonizing highly stressed and dead trees. Environmental Entomology 33: 28-34. Lovelady CN, Pulley PE, Coulson RN, Flamm RO. 1991. Relation of lightning to herbivory by the southern pine bark beetle guild (Coleoptera: Scolytidae). Environmental Entomology 20: 1279-1284. Mason RR. 1970. Comparison of flight aggregation in two species of southern Ips (Coleoptera: Scolytidae). Canadian Entomologist 102: 1036-1041. Thatcher RC, Barry PG. 1982. 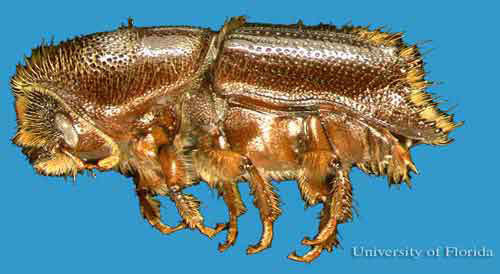 Southern pine beetle. USDA Forest Service, Washington, D.C. Forest and Disease Leaflet No.49. 7 p.
USDA Forest Service. 1985. Insects of Eastern Forests. Miscellaneous Publication No. 1426. Washington, DC. 358-359. Vité JP, Bakke A, Renwick JAA. 1972. Pheromones in Ips (Coleoptera: Scolytidae): occurrence and production. Canadian Entomologist 104: 1967-1975. Originally published as DPI Entomology Circular 417. Photographs: David T. Almquist and John L. Foltz, University of Florida; Jeffrey M. Eickwort, Albert E. Mayfield III, and Wayne N. Dixon, Florida FDACS; Ronald F. Billings, Texas Forest Service. Publication Date: September 2006. Reviewed: October 2018.